What Is A Mezzanine And How Can My Warehouse Benefit From One? A mezzanine is often thought of as the upper level of a theater. Patrons sit in the mezzanine to get an aerial view of the stage, and the mezzanine in your warehouse overlooks the rest of the facility. Your warehouse may be limited to the floor space you have, and the mezzanine opens up space that is greatly needed. Office space in your warehouse is taking up room you could use for storage. Installing or developing a mezzanine will give you office space that is removed from the warehouse floor. You immediately open up space that is needed in the warehouse, and you can see everything that is going on simply by peering out your office window. Many businesses function in this manner, and you can work away from the loud productivity that is happening on the warehouse floor. A warehouse that does not have an office may use a mezzanine to expand its storage space. You are creating a second floor of sorts where more items may be kept. Going up and down the steps with heavy items could be a problem, but you will gain storage space that is greatly needed. A mezzanine may contain a special storage area for sensitive documents, and you might install a climate control unit in this storage area. Your mezzanine could be a library of documents, or it might be the place where you store valuable items before they are shipped off. Set aside a little space with the mezzanine when you do not have another room to use. Your mezzanine may make use of the upper reaches of your warehouse without putting you or your employees in danger. 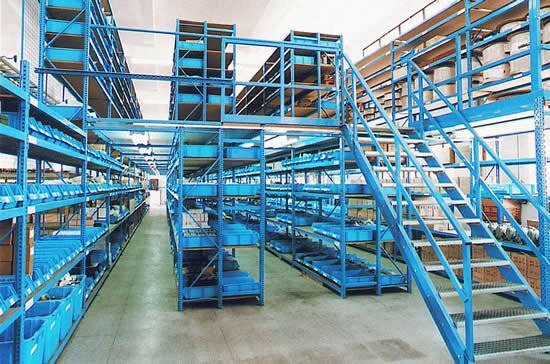 You can avoid climbing up the shelves in the warehouse by using the mezzanine level, or you may use part of the upper level of the warehouse for your mezzanine. Turning a warehouse into a new space is possible when you install the mezzanine. Your mezzanine could become the VIP room in a nightclub, the private dining room in your restaurant or the conference room in your new office. Never underestimate how much exclusivity you can create with the mezzanine, and you can create privacy when it is needed in the room. You may create a loft apartment in a warehouse by having a mezzanine installed, and the lower level will be someone else’s living area. You are dividing the space into more than one living area that you may charge rent for, but you are keeping the two areas completely separate. Your warehouse can be transformed with the addition of a simple mezzanine level. Construction may begin at any time, and the mezzanine can be a room of any size. Create an office, a storage room, a conference room or an apartment that will maximize the square footage you have in the warehouse. The mezzanine could be the saving grace of your old warehouse.